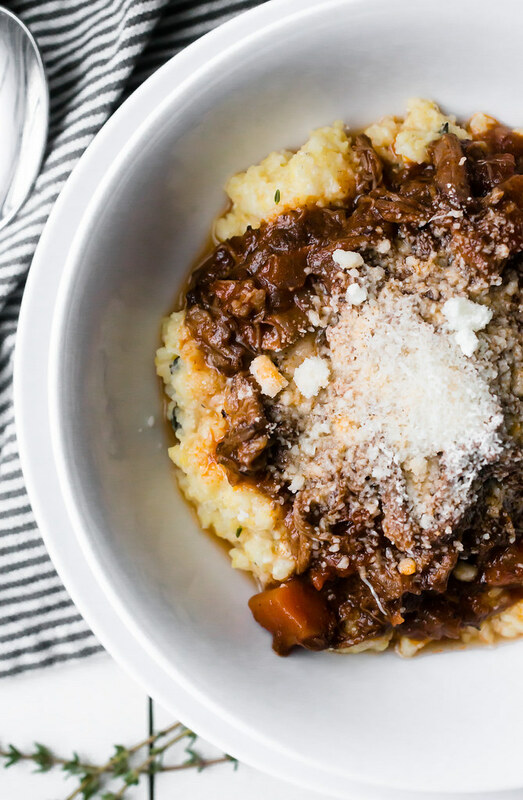 Cabernet short ribs ragu with parmesan polenta: The ultimate deep winter meal. Nothing fancy. Just stick to your ribs delicious and made in the crock pot. How about this frigid weather, people?! Are you hunkering down in your homes baking, building forts, doing puzzles, watching movies? I don’t know about you, but as much as I love winter – and I really do! – I get a little stir crazy when it’s so cold for so long. Perhaps it’s having a 6 month old in the house now and the house feels just a little bit more…claustrophobic. I don’t know. It’s more about not wanting to open the windows because it’s been so cold. The stale air. The stale DRY air. Ugh! I can’t take it anymore and neither can my nostrils! Anyway, we should probably take down the Christmas decorations but it’s not Valentine’s Day so this would be early for me. Just kidding! (sort of.) That would probably make the place feel a little more open but I don’t know. I still just want to hide under a blanket with a book in front of the fireplace. But then there’s diapers and bottles and tummy time (which, now is more like chase the rolling baby all over the house time) so my reading time is about 2.5 minutes before I fall asleep in bed each night. I MIGHT make it through 2 books this year at that rate. I’m totally rambling here, aren’t I? Sorry! 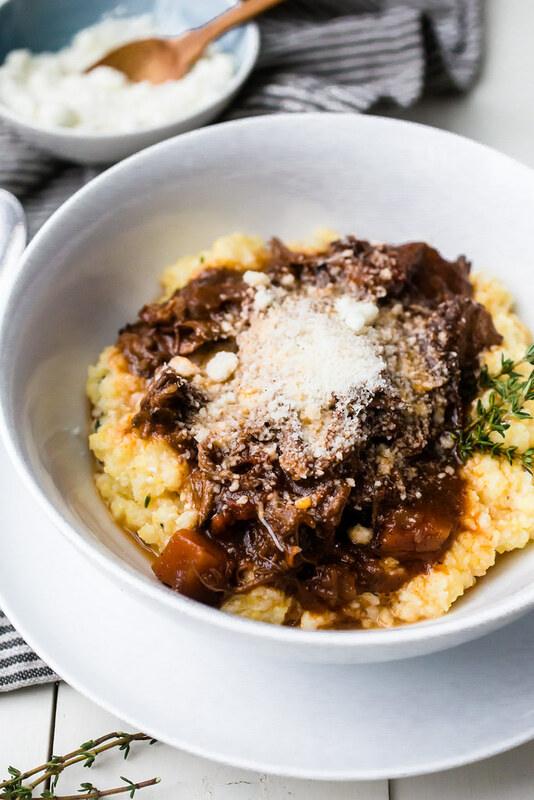 We should probably get to this Cabernet short ribs ragu with parmesan polenta. ‘Cause really, it’s the best – the BEST! – dinner I’ve made it quite a while. Although, the crock pot actually made this dinner, not me. Ha! And it couldn’t have been easier to make because the crock pot does all of the hard work to slow cook the short ribs down to a fall-apart tender state in a thick tomato-based sauce. It’s a sauce you’ll want to sop up with some crusty buttered bread – some whole grain ciabatta maybe? And the recipe makes a ton of sauce so there’s enough to feed a big crowd or reheat for leftovers for a few daaaays. I’ve made short ribs this way for years now and I totally love how the Cabernet adds some heft of flavor to sauce without overpowering it. It’s not a wine-flavored sauce at all so don’t worry if you’ll be serving it to non-wine or white wine-only fans. And I’ve served these Cabernet short ribs all shredded up like I did here in the ragu and on the bone – both ways are fantastic! I’ve also served them over mashed potatoes, egg noodles, cheesy hasselback potatoes, and plain polenta. I’m really partial to this creamy polenta since I’m basically in love with all things cornmeal-based. Give me ALL THE GRITS! And the addition of a heaping dose of parmesan cheese and some fresh thyme just make this polenta completely irresistible. Polenta is made of cornmeal. You can find it pre-cooked in a tubular shape in the produce section of many grocery stores these days. But it’s SO easy to make at home! You can basically use any type of cornmeal to make polenta. I prefer coarse ground cornmeal to make polenta because finely ground cornmeal tends to clump very easily when it hits a pot of boiling water. Bob’s Red Mill coarse ground cornmeal is my go-to brand (I’m not sponsored by them – just love them!) but I’m sure other brands are great too. And if you live in the South or Midwest where you can buy local cornmeal, that might be your favorite option! You can also find polenta packaged as dry, uncooked “polenta” in the Italian foods section of most bigger grocery stores these days too. So essentially, it’s really your choice about which product you use to make polenta but remember that it’s as simple as buying cornmeal. 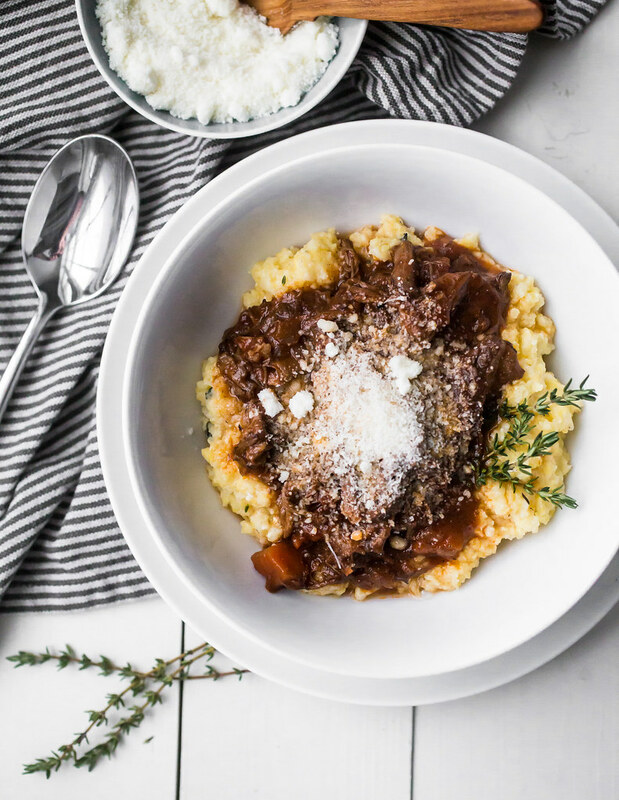 This Cabernet short ribs ragu and parmesan polenta combo couldn’t be more of a insanely perfect deep winter meal. The kind that sticks to your ribs. The kind that you crave after shoveling more snow than you care to admit. It’s the kind of meal you want to come home to after it’s been simmering itself away all day in the crock pot, and that’s ready for you to eat about 20 minutes after you walk in the door. It’s a lot like that crock pot loaded baked potato soup I made a couple years ago in these ways. But Cabernet short ribs automatically beat soup any day in my book! And since you’ll have some Cab leftover from the bottle, you may as well just pour yourself a glass. Go ahead. You earned it. 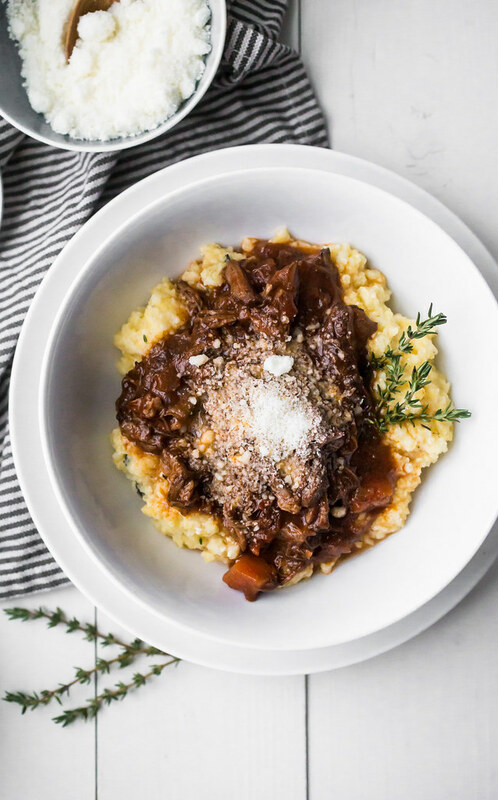 Cabernet short ribs ragu is the ultimate sauce to serve over parmesan polenta, buttered noodles, or creamy mashed potatoes. 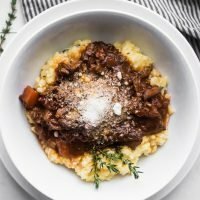 It's the best of a deep winter meal that simmers all day in the crock pot and is just about ready to eat when you walk in the door at night. Saute the onions, carrots, celery, tomato paste, and thyme in the leftover short rib fat, about 8-10 minutes, until the onions have softened and are lightly browned. Stir in the flour and cook, stirring for about 1 minute. Whisk in the wine and vinegar until the mixture is smooth, scraping up the bits on the bottom of the pan, and cook for about 5 minutes, until the liquid has thickened and reduced down to about 1 cup. Transfer the mixture to the crock pot and stir in the chicken stock and bay leaves. Nestle the short ribs in the sauce. Cook on LOW for 9 to 11 hours or on HIGH for 5 to 7 hours. Once the short ribs are fall-apart tender, remove them from the crock pot, remove the meat and fat from from the bones (discard the fat), and coarsely shred the meat. You don't want to shred too much, but rather, you'll want bite-size chunks of short ribs here. Skim the liquid fat off the top of the sauce and discard. Remove the bay leaves and discard. Return the shredded short ribs to the sauce and stir to combine. Season with salt and pepper to taste. 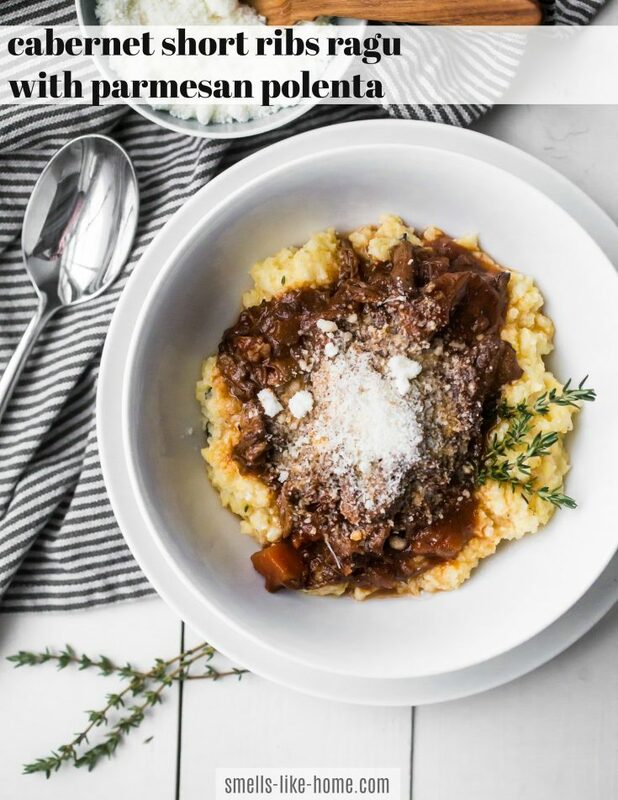 Keep the crock pot on the warm setting (if yours has this) while you make the polenta (if you're making it - recipe is below). Sprinkle with chopped parsley or thyme before serving. Storage: Leftover ragu can be refrigerated for 2-3 days or frozen for up to 2 months for additional meals. I suggest freezing the ragu in quart-size zip-top bag laid flat in your freezer. This takes up much less space than freezing in containers. Thaw in the fridge overnight. 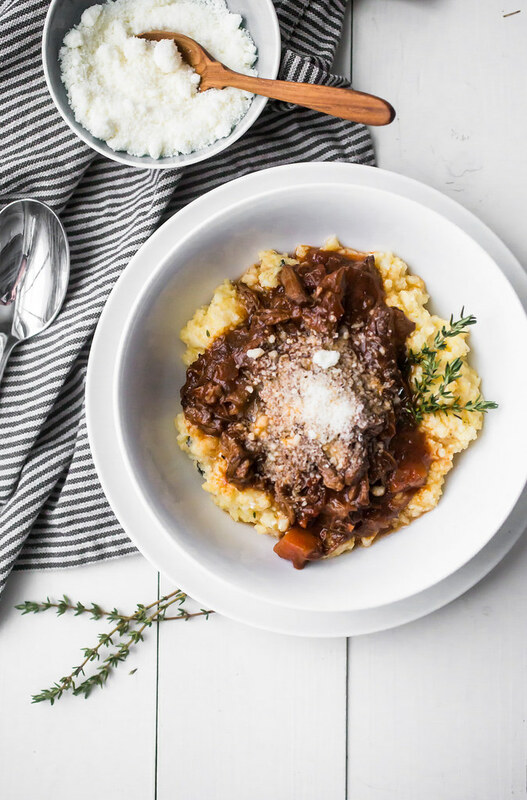 Parmesan polenta is a creamy and cheesy side dish or base layer for meals like cabernet short ribs and beef stew. It cooks in about 25 minutes and leftovers can be reheated well. Bring the water to a boil and slowly whisk in the cornmeal as you pour it into the water in a steady stream. Stir in the salt. Continue to whisk frequently until the cornmeal thickens and is soft to the tooth, reducing the heat along the way if the mixture bubbles up too much. This should take about 15 to 17 minutes. Whisk the butter into the cornmeal - let's start calling it polenta now - until melted and then whisk in the parmesan cheese and thyme. If the polenta is too thick, stir in a little water, milk, or cream to loosen it up. 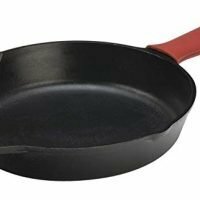 Serve immediately while still hot. Storage: Leftover polenta can be refrigerated for 2-3 days and reheated in the microwave without sacrificing too much of the original texture. Add a little water, milk, or cream to loosen it up as needed when you reheat it. The instructions say “Transfer the mixture to the crock pot and stir in the chicken stock, tomatoes, and bay leaves.” but the ingredient list doesn’t include tomatoes…please advise! So sorry about this! It’s just the tomato paste for this recipe. Do you think all the prep work can be done the night before, kept in the fridge, and then turn the crockpot on in the morning? Would love to make this on a weekday, but won’t be able to find the time to do the first two steps before work! 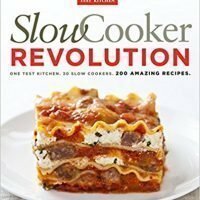 I’m a crockpot novice – teach me! Hi Alex, Great question! Yes, you can definitely do this. 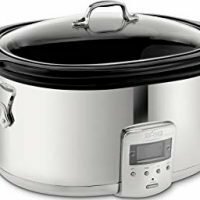 Cover the crock pot tightly with plastic wrap before putting it in the fridge and then remove the plastic wrap in the morning before putting the crock pot cover on and setting the time. You may need to allow for some extra time for everything to cook since the food will be cold so keep that in mind. Let me know how this meal turns out for you! No longer a polenta virgin!